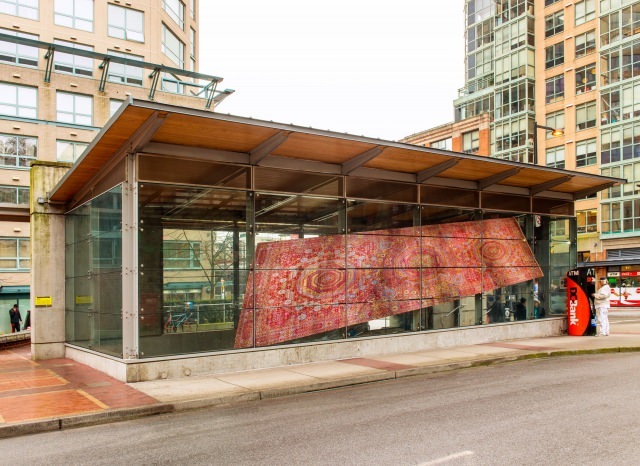 The Contemporary Art Gallery presents an ambitious new commission at the Yaletown-Roundhouse Station by Canadian artist Shannon Bool. Bool typically references a wide variety of historical and monumental objects in her work, commenting on the role of decorative arts within art history, as well as on the change in meaning that occurs through the replication and alteration of significant cultural forms. 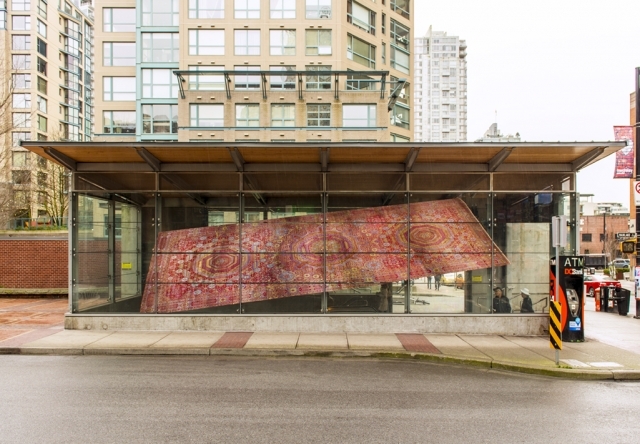 For the Yaletown-Roundhouse Station, Bool has worked with a photographer to document the sixteenth-century Egyptian Medici Mamluk carpet, recently rediscovered stored in the Palazzo Pitti in Florence, Italy. Unusual due to its gigantic size and pristine condition, Bool has painstakingly pieced together individual images to reproduce the whole carpet at exact scale across the glass facade of the building. Suspended in the everyday space of the station and tilted as if afloat, the work shows some of the mathematical and geometrical sensibilities that are seldom acknowledged but directly influenced Renaissance thought. Amazing in its detail and intricacy, literally and metaphorically the image records both the patterns and passages of time, in much the same way as the busy station is itself an embodiment of a space of people passing through.